This mosaic is my own interpretation of "Quan Yin And The Dragon King". My version of Quan Yin presents considerably more feminine in form than most interpretations. 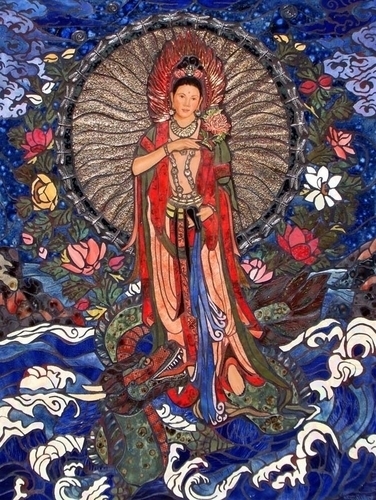 Quan Yin is shown pouring a stream of healing water, the "Water of Life," from a small vase. With this water devotees and all living things are blessed with physical and spiritual peace. In my mosaic, she is with the dragon king.